Back today with another one of my favorite CHA projects. This one is a bit of fantasy after last weeks more personal piece. The shadowbox is made with a 5.75 x 5.75" Configurations box with all but one of the small inner boxes removed. The little girl is part of the Found Relatives pack. Although, I did add vintage tatted lace across the front of her dress. As I said in a previous post about Found relatives, I like to make up stories about the people. Her story is that she wandered into a conservatory where specimens of exotic plants and other oddities are kept...hence the corked domes and low slung branch. A little Alice in Wonderland meets Downton Abby I think. 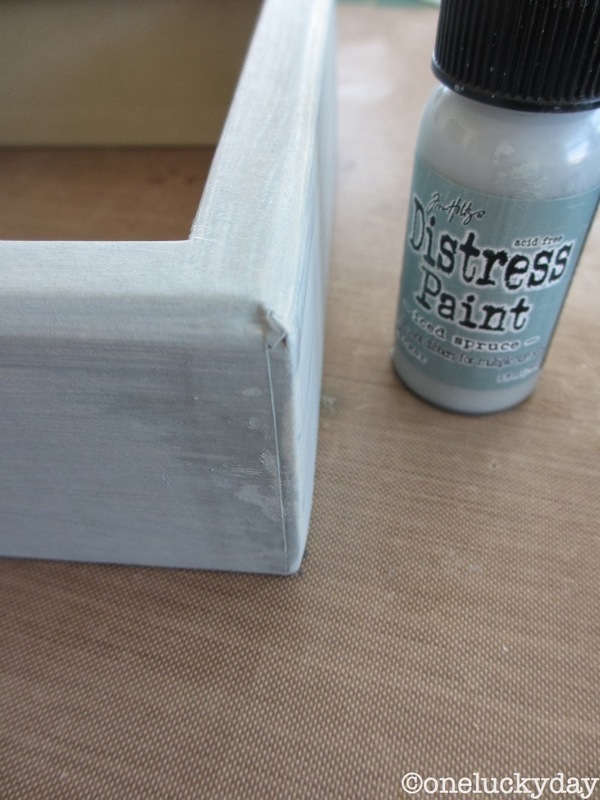 The box was painted with Iced Spruce and set aside to dry. I cut manila cardstock using the new Frameworks die - Courtyard. 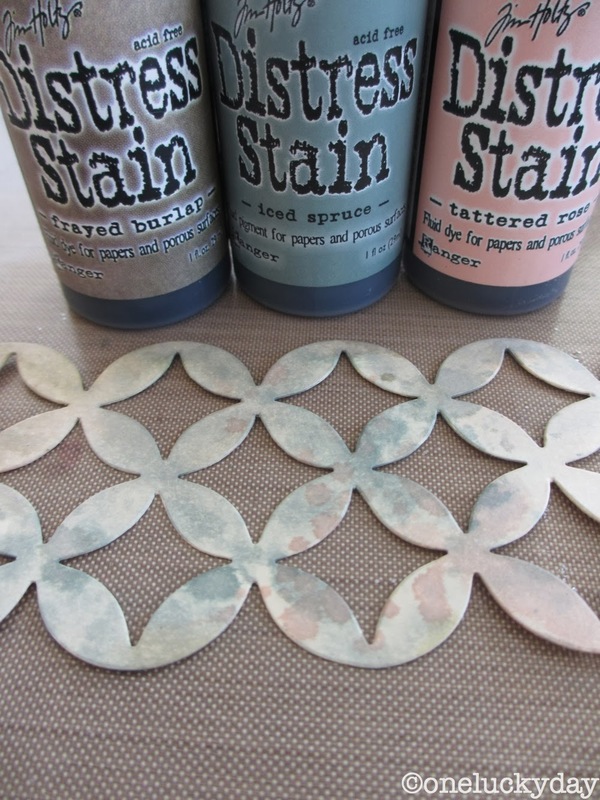 Then colored the cardstock using Distress Stains Frayed Burlap, Iced Spruce and Tattered Rose. I added a little Brushed Corduroy around the edges of the Frameworks with my Blending Tool. Then added the Frameworks to the sides of the box with Muti-medium, including a layer over the top of the Frameworks to seal it. 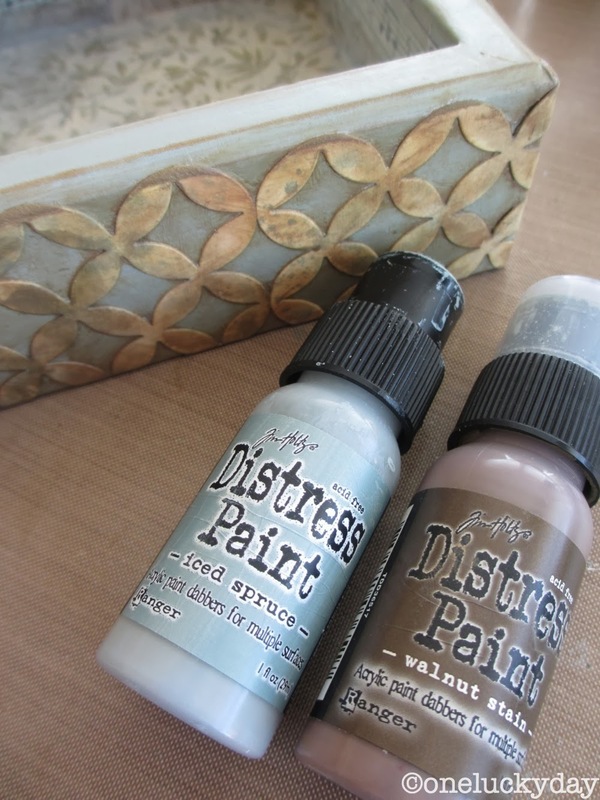 Once dry, I used my fingers to add more Iced spruce and Walnut Stain Distress Paint over the top. Wallflower paper from the 8 x 8 mini stash and Tissue Tape were added into the inside of the box with Multi-medium...with more paint over the top. I love how the paper really looks like miniaturized chinoiserie wallpaper! While that part was drying I worked on the Foundations feet using Iced Spruce Distress paint and Alcohol Ink in Pebble, as well as Mushroom. For the Corked Domes, I added a butterfly from the Remnant Rubs Sheet to one and a metal flower stock to the other. I painted the flower stock with Adirondack Dabber paint in Aqua and Citrus. A Clock Key was added to the top as well as a Word Band on the front. 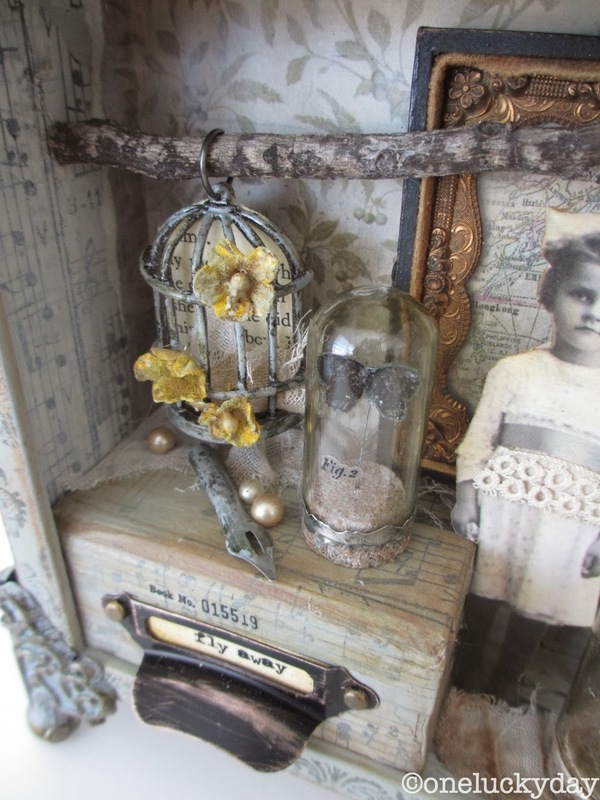 More remnant rubs were added, as well as a stick from my neighbors tree, a vintage picture frame and vintage pearls. I think the vintage picture frame really makes the piece. Something I bought in a junk shop but not cheap by any means...think I paid $12-15 dollars for it since the case is leather and it did come with an old tintype. I just removed the tintype and added a bit of map paper. 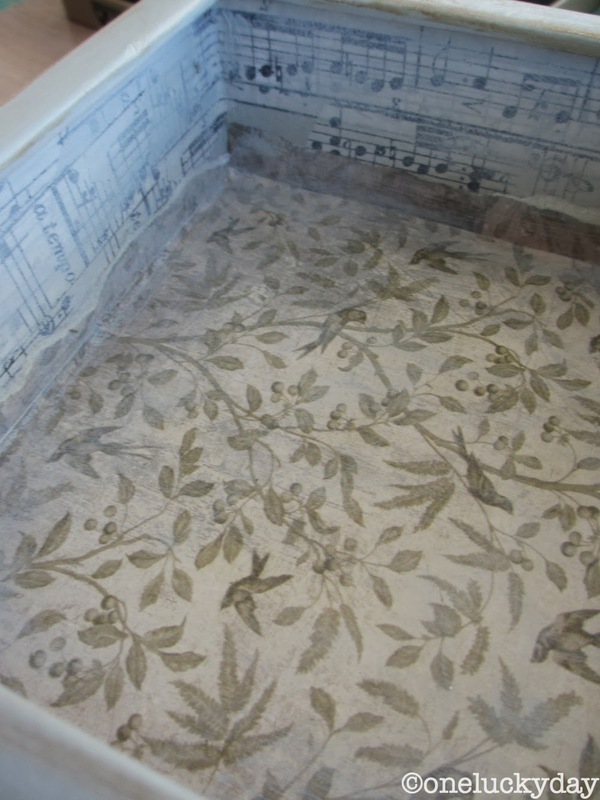 I also stamped the front edge with the Distress Damask stamp and Watering Can Archival Ink. Loving this combination. 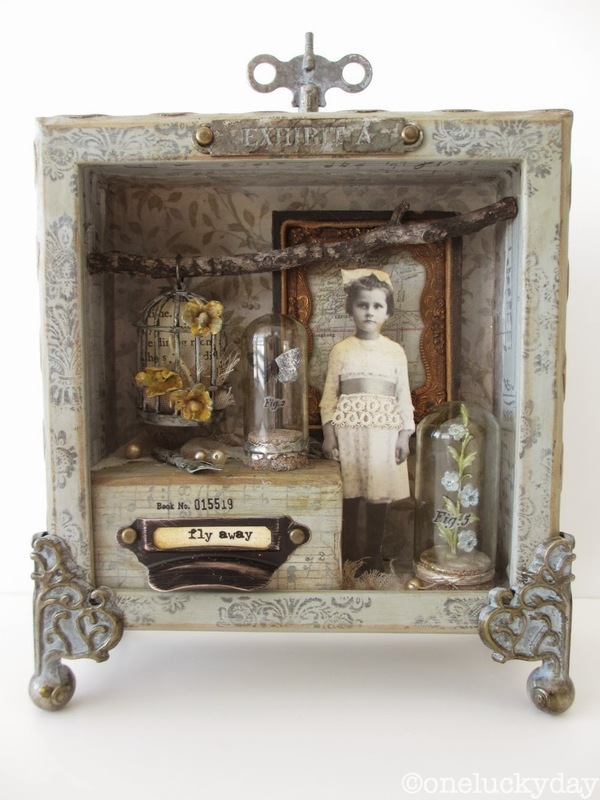 Well, that's it for today...hope this shadowbox inspires some great creations this week! Beautiful! The details are amazing. I love that new die. Oh the possibilities! I think we should all take up a collection so you can buy a new bottle of Iced Spruce! Love this little box! The little bird cage (without the bird) hanging from the branch. The overall color, the way the little girl stands out from the background. The addition you made to her dress. The stamping around the edge, the background. Can you tell I just ADORE this? One of the best things you've made, may I say. Oh yes, that frame gives it authenticity, too, I think. And the flower in the dome! Ok, I'll stop now. This is such a fabulous creation - so many interesting and wonderful details to take in! I love those domes and the frame behind the girl! 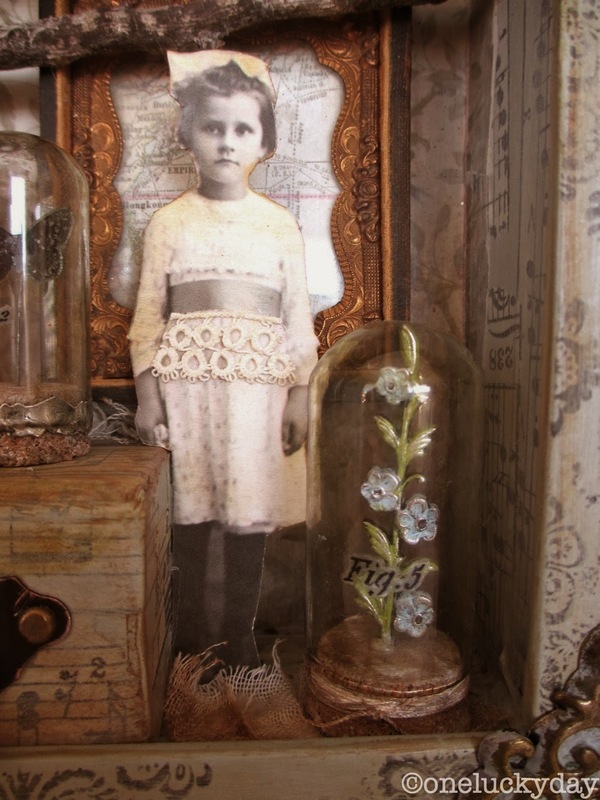 You really made the most of every iota of space in this shadow box. Beautiful - love the use of the frameworks on the outside, and that background paper is just gorgeous! The little girl is a delight too, and that metal flower - well, all of it really. Wallflower is going to bankrupt me! I just love your story about her. Fun box. Can't wait to get my inky little paws on the wallflower paper. Thanks for the inspiration. 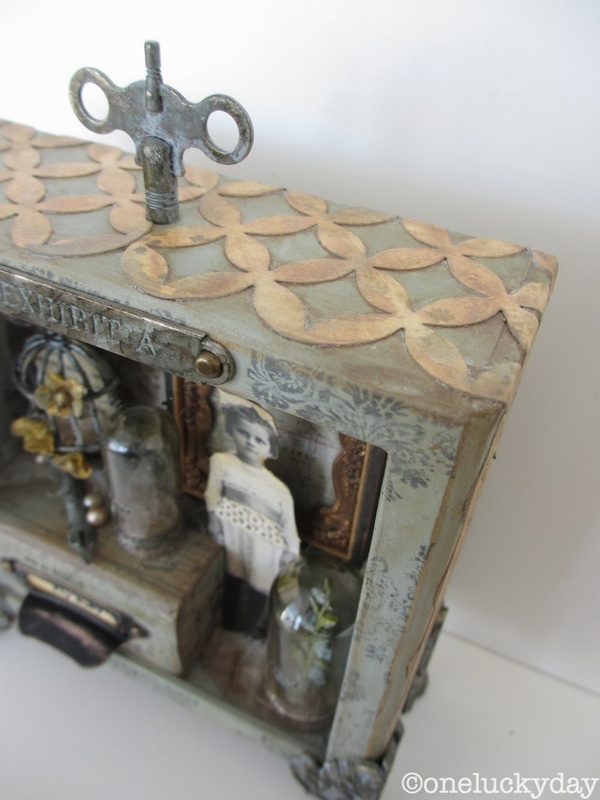 Wonderful little shadow box. I am so excited about the new items, I can't wait to get some try. Great work Paula. Looks like the perfect box for another class. ;) Loved your book about your Dad. He was one of the best. As was your mom. Got me a little choked up. Love this box! Thanks for sharing!